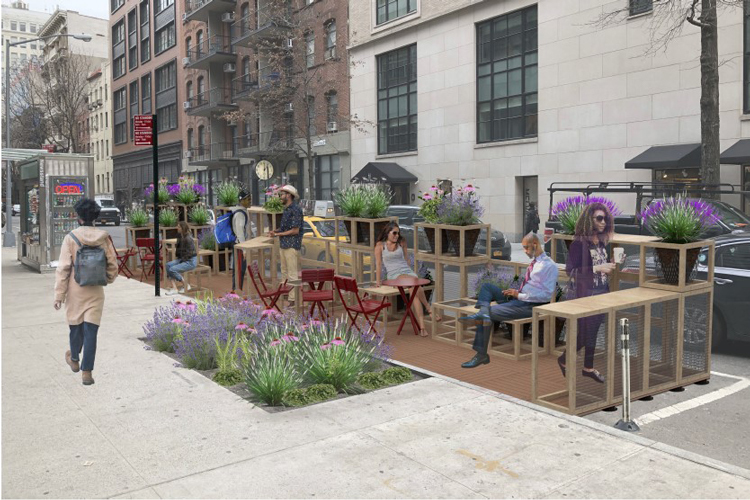 Street Seats is a sustainably designed temporary public space for New Yorkers to sit, socialize, and people-watch. New York — Parsons School of Design at The New School presents Street Seats, a sustainably designed temporary public space for New Yorkers to sit, socialize, and people-watch. Designed and constructed by undergraduate Architecture, Interior Design, Product Design, and Food Studies students, with assistance from Design and Technology and Lighting Design graduate students, the project sits in two parking spaces at the northeast corner of Fifth Avenue and 13th Street in Greenwich Village. Street Seats is an elective design-build class, now in its fourth iteration, offered within Parsons’ School of Constructed Environments. The Parsons Street Seats has been designed with an eye toward sustainability. Repurposed fishing net is used as netting for seats, planters, and screens; naturally rot-resistant Western red cedar is used for the structural modules and countertops; and coconut fiber and jute webbing, both of which are biodegradable, are used for the planters. Operating independently from the electric grid, the lighting system uses solar panels, batteries, and energy efficient LED lighting that is activated by a daylight sensor to provide artificial light after sundown. Additionally, planters are installed on the edges of the seating area to reduce noise from the street and provide a pleasant environment in which to sit and relax. Herbs and native plants will add fragrance and invite pollinators. The design was reviewed by Silman Structural Engineers. Seeds were donated by the Greenbelt Native Plant Center; Sam Robinson of Greenwood Robinson contributed gravel for the planters; Voltaic Systems provided material and consulting support for solar-powered lighting; and Van Houten Farms and Westco FG Corp.provided additional discounts on materials. Previous ArticleUSDOT awards $75 million grant for light rail in Tacoma, Wash.